Family Faith On-the-Go is our resource created just for families with faith forming activities that families can engage in together in order share in meaningful conversations and spiritual practices. We know family life is busy and on-the-go so we hope for these resources to be simple and powerful so you can implement them at home and in your busy life. The books below are recommended by our children's pastor to help you better understand and aid in their spiritual development. Click on the images below to be taken to their Amazon listing and learn more! Discover how much the parent's role impacts spiritual formation in children and get suggestions and resources to reflect on how to better support your child(ren) as they grow in love with God! 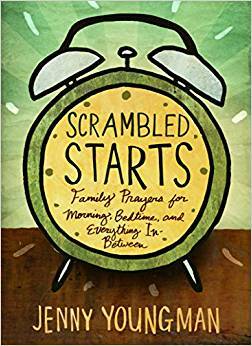 A simple, practical guide to integrating prayer into busy family life! This is a series that provides a book for every age / grade and offers a breakdown of what kids need in faith and development at each age! Check back often as we update this section with content to help you love and lead your children on their faith journey! Unfortunately, there are times where difficult things happen in life and it's the job of parents and those who work with and care for children to be available to address questions that children may have. This resource is made to help caregivers discuss tragedy with children from a Christian perspective. Click below to for a downloadable version!